A growing share of Americans are religiously unaffiliated. We recently asked a representative sample of more than 1,300 of these “nones” why they choose not to identify with a religion. Out of several options included in the survey, the most common reason they give is that they question a lot of religious teachings. 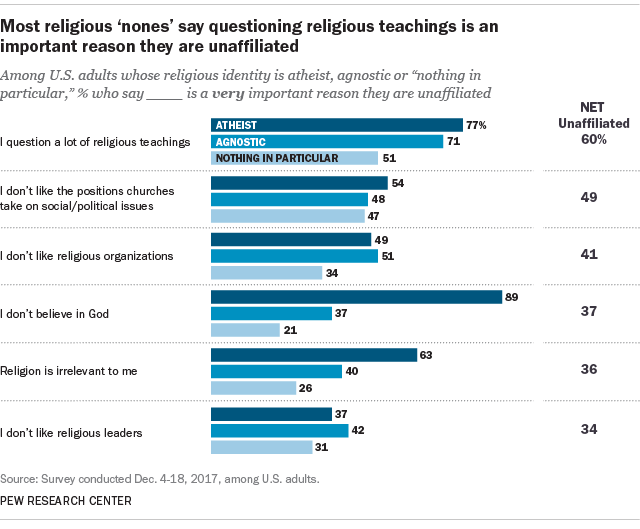 Six-in-ten religiously unaffiliated Americans – adults who describe their religious identity as atheist, agnostic or “nothing in particular” – say the questioning of religious teachings is a very important reason for their lack of affiliation. The second-most-common reason is opposition to the positions taken by churches on social and political issues, cited by 49% of respondents (the survey asked about each of the six options separately). Smaller, but still substantial, shares say they dislike religious organizations (41%), don’t believe in God (37%), consider religion irrelevant to them (36%) or dislike religious leaders (34%). Those who identify as atheist, agnostic or “nothing in particular” tend to give different reasons for their lack of affiliation, showing that “nones” are far from a monolithic group. For example, about nine-in-ten self-described atheists (89%) say their lack of belief in God is a very important reason for their religious identity, compared with 37% of agnostics and 21% of those in the “nothing in particular” category. Atheists also are more likely than other “nones” to say religion is simply “irrelevant” to them (63% of atheists vs. 40% of agnostics and 26% of adults with no particular religion). We also asked religious “nones” which of the six potential statements is the single most important reason they are unaffiliated. Again, questioning religious teachings is among the top responses, with a quarter of all “nones” saying it is the most important reason. A similar share (22%) cite lack of belief in God, and 16% say the most important reason is that they dislike the positions churches take on social and political issues. There are major differences among the three unaffiliated subgroups on this question as well. Three-quarters of atheists say the most important reason they are atheist is that they don’t believe in God. Far fewer agnostics (17%) and people in the “nothing in particular” group (8%) say this. Among self-described agnostics, the most important reason cited for being agnostic is the questioning of a lot of religious teachings (38%). 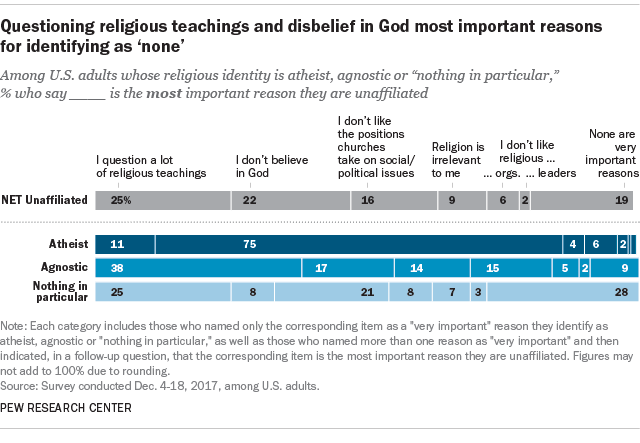 People who identify as “nothing in particular” give a variety of responses when asked about their most important reason for not affiliating with a religion – and no single reason predominates. A quarter say the most important reason is that they question a lot of religious teachings, 21% say they dislike the positions churches take on social and political issues, and 28% say none of the reasons offered are very important. In previous research, the Center asked religiously unaffiliated Americans who were raised in a religion (who make up a majority of all religious “nones”) to explain in their own words why they no longer identify with any religious group. This question also elicited a wide variety of responses from the “nothing in particular” group. Some said they do not believe in religious teachings or dislike organized religion, while others said they are religious (though unaffiliated) or that they believe in God but do not practice any religion.